Make a Tee-Pillow from that extra special event in your life. 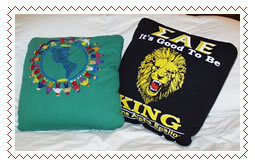 Tee-Pillows are great for those special memories that stand out above the rest. You may not wear that t-shirt anymore, but you'll remember that unforgetable concert or event every time you look at your pillow! "Thanks for the quick service. I'll be sure to tell my friends about your company."